The Justice Minister stopped short of saying that he does not believe the Sinn Féin leader, but Pearse Doherty denied that Adams is a “liability”. THE JUSTICE MINISTER has said that he has difficulty accepting the explanations of Sinn Féin leader Gerry Adams. In light of this week’s documentary The Disappeared, Adams has faced renewed questions about his role in the murder of Jean McConville. McConville’s daughter yesterday called for the abduction and murder of the mother-of-ten to be treated as a war crime. 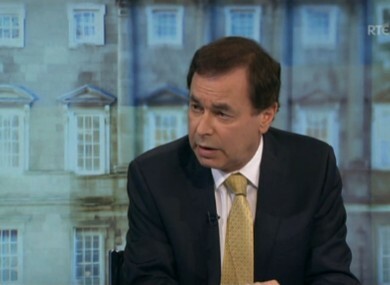 Asked on RTÉ’s The Week In Politics about Adams’ denial that he had any hand in McConville’s murder, Alan Shatter said that questions had to be answered. I find the approach of Gerry Adams and Sinn Féin difficult to accept. “Firstly I think it’s right to praise RTÉ and the BBC for what was a very important programme. “It is for Gerry Adams to decide what he says in public, but I think it is important not to trivialise the issue. Shatter went on to say that Sinn Féin had a “credibility gap” on the issue. Also on the panel was Sinn Féin’s Pearse Doherty, who denied Áine Lawlor’s suggestion that Adams is a “liability”. Doherty said that both Adams and Martin McGuinness had called on people to come forward. He went on to say that the actions of the IRA was wrong. Email “"I find the approach of Gerry Adams difficult to accept" - Alan Shatter”. Feedback on “"I find the approach of Gerry Adams difficult to accept" - Alan Shatter”.